Too often we hear that 3D printing is at best only a way for making prototypes before you invest in “real” manufacturing. At worst, it’s a way to make little toys for your desk or cubicle. The detractors say that 3D printing doesn’t lend itself to building practical devices, and even if you do manage to print something useful, you probably could have made it faster or better with more traditional manufacturing methods. So naturally we’re especially excited when we see a printed design that manages to buck both criticisms at once. Not only does this magnetic dust port connector created by [Taylor Landry] have a clear practical purpose, but its design largely defies normal construction techniques. It consists of two flanges, sized for common 4″ flexible ducting, which feature embedded magnets on the faces. This allows the two sides of the coupling to easily be connected and disconnected without relying on threads or a friction fit. 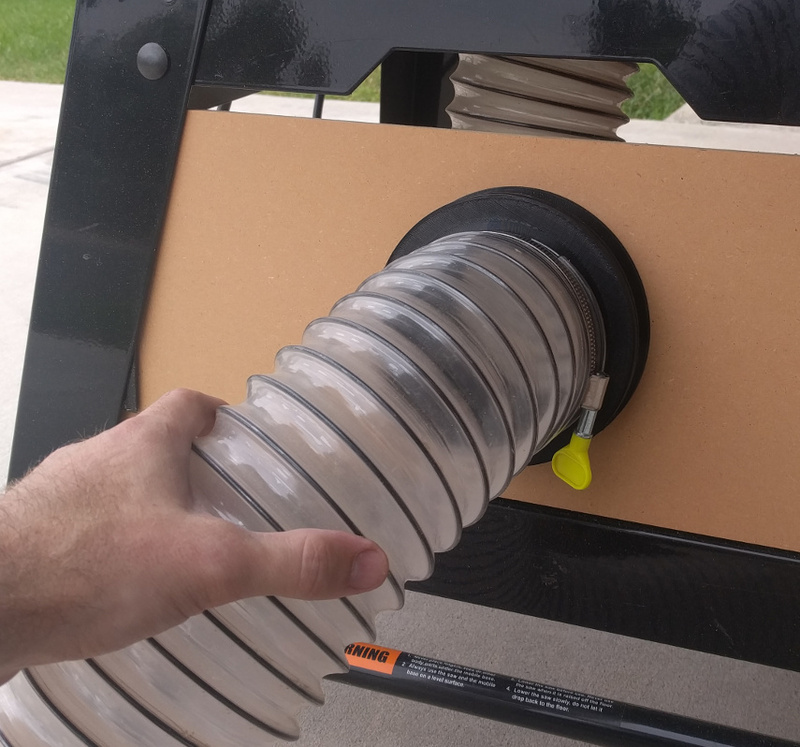 Not only would threads likely get caked with sawdust, but the magnetic connection allows the coupling to release in the event somebody trips on the duct or the tool is moved. Currently only one type of coupling is available, but [Taylor] says he’s looking at adapting the design to other tools. He also mentions that the magnets he’s currently using are a custom size he had left over from a previous project, so if you’re looking to replicate the design you might need to tweak the magnet openings. Luckily, he’s provided the STEP files so you don’t have to hack the STL. A quick connect dust port like the one [Taylor] has come up with seems like it would be a perfect addition to the whole-shop dust collection systems we’ve covered in the past. In fact, it might not even be the only 3D printed component in the system. Woodworking is the fine art of turning dead tree carcasses into precision instruments. That means breaking out the saws and chisels and making many, many precise cuts over and over. If you have a table saw, every problem becomes a piece of wood, or something like that, and we’ve seen some fantastic jigs that make these precision cuts even easier. We’ve never seen something like this, though. It’s a box joint jig for a table saw, it’s automated, and it puts barcodes on boxes. [Ben] built this box joint jig a few years ago as a computer-controlled device that slowly advances a piece of wood on a sled, allowing him to create precise, programmable box joints. The design is heavily influenced from [Matthias Wandel]’s screw advance box joint jig, but instead of wood gears (heh), [Ben] is using the Internet of Things. Or a Raspberry Pi, stepper motor, and a few LEDs. Same difference. Although [Ben]’s previous box joints were all the same size, a programmable box joint jig can do some weird-looking joints. That’s where [Ben] got the idea to encode a barcode in walnut. After using a web app to create a barcode that encodes the number 255 — this is important for later — [Ben] programmed his jig to cut a few slots. The box was finished as you would expect, but there’s a neat addition to the top. It’s a combination lock that opens when the combination is set to 255. It’s brilliant, and something that could be done with some handsaws and chisels, but this jig makes it so easy it’s hard to think the jig wasn’t explicitly designed for this project. It’s the latest in instrumentation for the well-appointed shop — an acoustically coupled fast Fourier transform tachometer. Sounds expensive, but it’s really just using a smartphone spectrum analyzer app to indirectly measure tool speeds. And it looks like it could be incredibly handy. Normally, non-contact tachometers are optically coupled, using photoreceptors to measure light flashing off of a shaft or a tool. But that requires a clear view of the machine, often putting hands far too close to the danger zone. [Matthias Wandel]’s method doesn’t require line of sight because it relies on a cheap spectrum analyzer app to listen to a machine’s sound. The software displays peaks at various frequencies, and with a little analysis and some simple math, the shaft speed of the machine can be determined. [Matthias] explains how to exclude harmonics, where to find power line hum, isolating commutator artifacts, and how to do all the calculations. You’ll need to know a little about your tooling to get the right RPM, and obviously you’ll be limited by the audio frequency response of your phone or tablet. But we think this is a great tip. [Matthias] is no stranger to shop innovations and putting technology to work in simple but elegant ways. We wonder if spectrum analysis could be used to find harmonics and help with his vibration damping solution for a contractor table saw. We’ve all seen finger joints or box joints, those interlocking puzzle pieces that make laser-cut plywood enclosures such a fixture for DIY projects. But laser cutters make finger joints look much easier to fabricate than they are with traditional woodworking tools, which often lead to disappointing results. But this finger joint cutting robot is no traditional woodworking tool, and [timschefter] put a lot of work into building the rig. We have to admit that when we first saw the video below, the thought of having a table saw in our shop that could be turned on with a button on a phone gave us pause. But on closer analysis, it looks like safety was a major concern with this build. With a prominent e-stop and an interlock switch, the small table saw that forms the foundation of the robot should be safe enough. On the table top is a sled with a linear slide that moves the workpiece perpendicular to the blade, and the sled moves back and forth over the blade with pneumatic cylinders. The joint is set up with a custom app which calculates the pin width and spacing, which can be evenly distributed across the panel, or, for a bit of geeky fun, controlled to make a joint that encodes a message in Morse. A lot of work went into this, and while it’s not the first robotic finger joint cutter we’ve seen, it’s pretty impressive. Now if it could only automate dovetails. Some woodworking operations require stock to be fed at a smooth, steady rate, for which purpose a power feeder is usually employed. They’re expensive bits of gear, though, and their cost can usually be borne only by high-output production shops. But when you need one, you need one, and hacking a power feeder from a drill and a skate wheel is a viable option. It should come as no surprise that this woodshop hack comes to us from [Matthias Wandel], who never seems to let a woodworking challenge pass him by. His first two versions of expedient power feeders were tasked with making a lot of baseboard moldings in his new house. Version three, presented in the video below, allows him to feed stock diagonally across his table saw, resulting in custom cove moldings. The completed power feeder may look simple — it’s just a brushless drill in a wooden jig driving a skate wheel — but the iterative design process [Matthias] walks us through is pretty fascinating. We also appreciate the hacks within hacks that always find their way into his videos. No lathe? No problem! Improvise with a drill and a bandsaw. Surprised that [Matthias] didn’t use some of his famous wooden gears in this build? We’re not. A brushless motor is perfect for this application, with constant torque at low speeds. Want to learn more about BLDC motors? Get the basics with a giant demo brushless motor. No matter what material you work with, the general rule is that with machine tools, the heavier, the better. Some people can’t afford or don’t want big tools, though, even with their natural tendency to reduce vibrations. That doesn’t mean something can’t be done to help the little tools, like reducing vibration in a contractor-grade table saw. This one might seem a little outside the usual confines of the hackosphere, but nobody can doubt [Matthias Wandel]’s hacker chops and he really shows off his problem-solving skills with this one. His well-worn contractor-style table saw has had more than a few special modifications over the years, some of which left it with a shimmy sufficient to vibrate workpieces right off the table. He fashioned a friction damper for the saw’s motor from wood, complete with ball and socket joints to allow full movement of the blade height and angle. That didn’t quite do the trick, but his incremental approach finally found the right combination of factors, and the video below shows a saw now stable enough to balance a nickel. If the name seems familiar but you just can’t place the hacks, check out [Matthias]’s recent wooden domino extruder, his shortcuts to tapping wood, or of course his classic wood gears layout software.